While we’ve focused mainly on selling on Amazon as a work from home job, eBay is still a huge online marketplace to expand your online sales. The best part is that while Amazon is getting all the attention, you can dominate your product category on eBay and take your business to the next level. 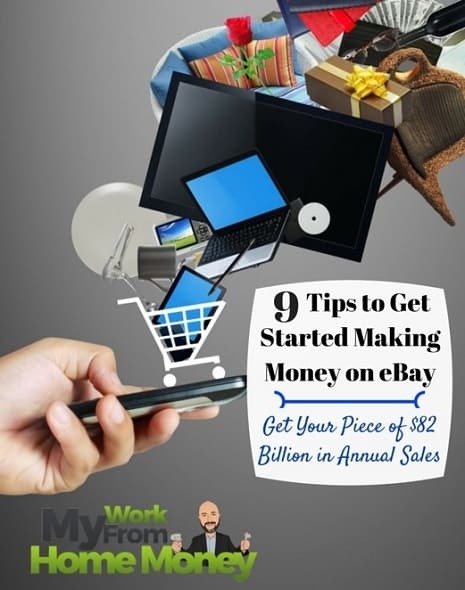 This post will take you through the steps to get started eBay selling and will kick off a series on making money on eBay. Another benefit to eBay selling is that it’s not an exclusive arrangement. Say you’ve got a growing Amazon FBA business from our earlier post, you can also sell your products on eBay to reach another huge group of buyers. Instead of having all your products shipped directly from the manufacturer to Amazon’s warehouses, you would ship some to your home address and sell those on eBay. I’ve spent so much time watching Amazon’s growth that I thought eBay was sooo 1990s but more than 25 million sellers moved $82 billion in merchandise last year. There are more than 250 million searches every day. Don’t think that eBay is just for used stuff and can’t work for a business selling new products. The majority (80%) of goods sold on eBay are new. Ignoring the site as an eBay seller means you’re missing out on a huge opportunity for your work from home strategy. If you’ve already been an eBay seller before then some of these steps might not apply but still take the time to scan through to pick up any tips you might have missed. Selling on eBay as a business has its differences compared to occasionally selling stuff from around the house. Your first few steps are going to be getting started as an eBay business seller, getting comfortable with the process and building your profile. If you have an old profile from selling before, make sure it’s not ruined with a lot of bad comments. If you got good feedback from your other sales then use that profile, otherwise you might consider starting a new business profile for eBay selling. 1) Focus on just making a few sales first to get some good reviews for your profile. People are still skeptical of online sellers and that feedback from other sales is going to be huge in building the credibility you need to make money on eBay. These first few sales aren’t about making lots of money but about becoming familiar with the process of selling on eBay and working out any problems. If you don’t have a PayPal account, you’ll need to set one up to make payments easier. You should also go through your eBay account and make sure your profile looks professional and helps to prove your credibility as a seller. Try out the free trial on Terapeak as well. The site offers data on a full year of eBay sales to see what is selling best and where people are making money. You can search for competitors to see how they are selling on eBay and see trends in different categories. Terapeak also has an Alibaba sourcing feature that helps you find the best manufacturers for your products. 2) Choose a few inexpensive items around the house to make your first few eBay sales. If you don’t already have products you’re selling on Amazon FBA, just grab a few things you don’t need. You want to sell things that are recognizable and that have enough demand that it won’t take too long to sell. Items priced between $20 and $80 usually move the fastest, especially any electronics. You don’t want to sell anything so inexpensive that people are likely to just go out and buy it locally but nothing so rare that nobody knows about it. 3) While manufacturer photos work really well on Amazon, you want to include real images of the product on eBay. If the product is new, then include pictures of the unopened box along with manufacturer images of the item. If it’s used, take a few pictures of the product from different angles so people can see there’s no scratches or defects. 4) Make sure you’re completely honest in your eBay description. Include how long you’ve used it and any defects, both physical and internal. Check out a product page for the item and list any missing accessories and even dents in the packaging. The more detailed you can make the description the more buyers will believe you because you’re laying it all out there. It will also avoid any negative feedback after you make a sale. Check out the eBay mobile app for your eBay selling. A lot of people find it easier to use than the website. 5) Whether you are selling things from around the house or your business products on eBay, you need to know the weight and size of the shipping package. Many an eBay seller has been brought down by offering free shipping before really knowing how much shipping would cost. If you can find a manufacturer’s website or another retailer’s page for the item, that should give you a good idea of weight and package size. Check out a few shipping carriers like Fedex and UPS to estimate shipping costs before you finalize your eBay product page. 6) You can use Terapeak to find out for how much others are selling the item on eBay. If you are just selling anything around the house to build your profile then price it fairly low to get the sale. You don’t have much feedback on your eBay account yet so people are going to be cautious about buying from you. When you start selling your business products, make sure you check Terapeak to see that you can price high enough to make a profit. 7) Ship your sale quickly or list handling time on your eBay seller product page. If you’re running a full-time eBay selling business or a traditional job, you might not always be able to get your sold items to ship immediately. If this is the case, give yourself a couple of days by listing a ‘handling time’ on your product page. Impatient buyers are one of the biggest sources of negative feedback on eBay so make sure everyone knows how long it will take to get their purchase. Many of the same tips that will make you successful selling on Amazon will also apply in eBay selling. It helps to focus on a niche or a group of products. This means you’ll really get to know buyers’ needs and how to sell your specific product group. Visit the eBay category for your niche and spend some time looking at what’s popular and the site’s buying guides. 8) Don’t forget to check out competitor listings and non-eBay listings of each product when writing your product pages. You want to be as descriptive as possible and use as much space as allowed. 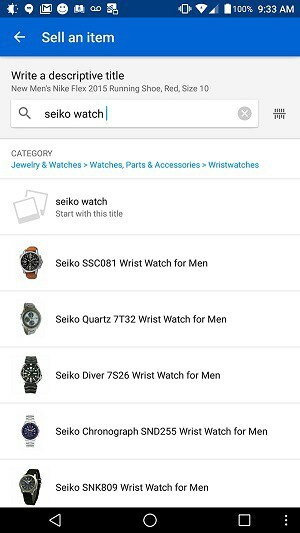 eBay search works a lot like other search engines on Amazon and Google and you’ll have a better chance at showing up if you use keywords in your description. 9) Ask people to follow your eBay store and make sure you link it to your website. eBay allows you to send out a store newsletter, an opportunity too many eBay sellers pass up. This is huge and you should be sending out a newsletter at least a couple of weeks before every holiday or shopping event. Don’t pass up the opportunity on eBay selling your products just because Amazon FBA is so hot right now. The auction site is still a huge marketplace for new and used items and you can make money on eBay. Follow the eBay selling strategy above to get started and check in for the rest of our posts to expand your work from home business. When you list items on eBay, we provide recommendations to help you create your listings. Our recommendations are based on research of similar listings, and are designed to help you get the most money for your items and sell them quickly. Our listing recommendations appear as you create a listing, in My eBay, and in Selling Manager and Selling Manager Pro. We also might send you an email reminder about the recommendations, with links to the specific listings that we think might need a little help. Our goal is to help you create listings that are more informative and attractive to buyers – and improve your chances of selling your items. For example, offering free shipping or accepting returns can make your listings stand out more than ones that don’t. Similarly, using descriptive keywords in your title can motivate buyers to look at your listing, instead of moving on to another listing in search results.